Microsoft Corporation (MSFT) develops, licenses, and supports a range of software products and services for various computing devices worldwide. Microsoft has paid uninterrupted dividends on its common stock since 2003 and increased payments to common shareholders every year for 7 years. The company is one of four AAA rated companies in the US. The most recent dividend increase was in September 2011, when the Board of Directors approved a 25% increase in the quarterly dividend to 20 cents/share. Microsoft ’s largest competitors include Apple (AAPL), Google (GOOG) and Oracle (ORCL). Over the past decade this dividend growth stock has delivered an annualized total return of 2.10% to its shareholders. The company has managed to deliver a 16 % annual increase in EPS since 2001. Analysts expect Microsoft to earn $2.79 per share in 2012 and $3.08 per share in 2013. 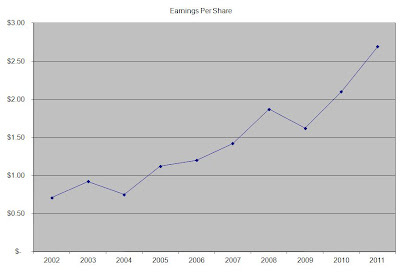 In comparison Microsoft earned $2.69 /share in 2011. The company has consistently managed to repurchase 3% of its outstanding stock since 2002. 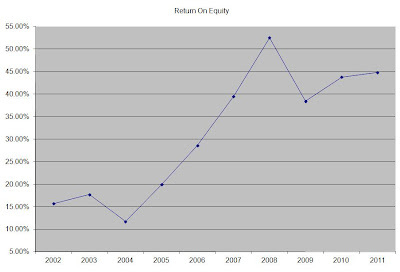 The company’s Returns on Equty has tripled over the past decade, to a mind boggling 45% in 2011. Rather than focus on absolute values for this indicator, I generally want to see at least a stable return on equity over time. Microsoft started paying dividends in 2003, and paid a onetime special dividend of $3/share in 2004. The annual dividend payment has increased by 11.50% per year since 2005, which is lower than the growth in EPS. I would expect Microsoft to keep increasing in dividends at 10% per year at least until it reaches dividend achiever status. A 12% growth in distributions translates into the dividend payment doubling every six years. If we look at historical data, going as far back as 2005 we see that Microsoft has managed to double its dividend almost every 6 years on average. 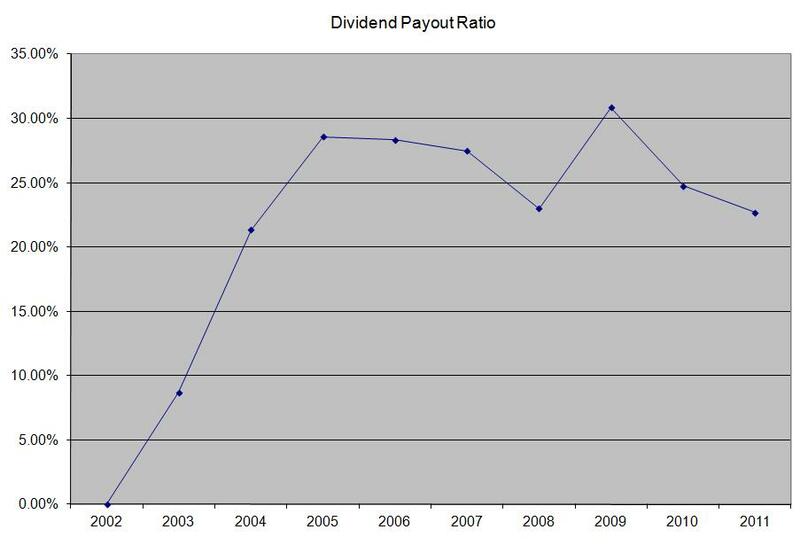 The dividend payout ratio has been stable between 20% and 30% since 2004. A lower payout is always a plus, since it leaves room for consistent dividend growth minimizing the impact of short-term fluctuations in earnings. Currently Microsoft is attractively valued and is trading at 9.50 times earnings, yields 3.10% and has a sustainable forward dividend payout. I would keep Microsoft on my radar, as it would be eligible for inclusion in my dividend growth portfolio when it becomes a dividend achiever.